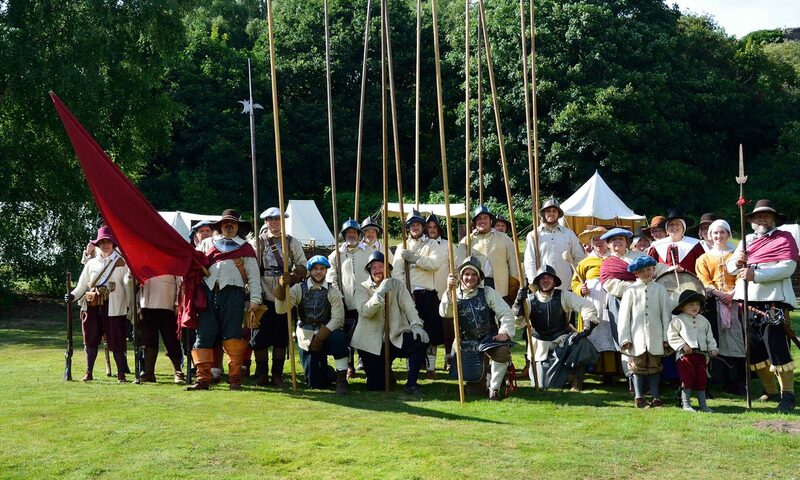 You’ll find us there on Sunday 9th September where we’ll have our living history camp set up and full of people depicting life in the 17th Century. We’ll have plenty of soldiers for you to talk to, who’ll be able to show you how the weapons worked up close, let you try on armour and see just how heavy it is to carry around and talk to you about the history of the era. We’ll also be demonstrating the weapons in action with drill displays, held throughout the day. If you’re wanting to give it all a go yourself, we’ll be running ‘Have-A-Go’ Soldiers drill for any budding soldiers, kids and big kids alike, who want to see what it’s like to try and use these weapons. Our camp will also have people showing traditional crafts and cooking methods, including sewing, knitting and cooking lunch for the troops. The highlight of the day will be a skirmish as broadly recreate Stafford’s Civil War past. In 1643, Stafford and its castle was held under siege. Parliamentary troops under the leadership of Colonel William Brereton claimed the town on the 15th of May, leaving the Royalists hanging on to control of the castle. Lady Isobel Stafford, a staunch Roman Catholic and Royalist supporter, held the siege for the Royalist cause refusing to surrender to Brereton. On the 5th June, renewed Parliamentary forces under the command of Colonel Hastings arrived and Lady Isobel was persuaded to leave, with a small garrison remaining in the castle. By the end of June the siege was over and the garrison had fled. The castle fell into Parliament’s hands and was eventually slighted to prevent further use by Royalist forces. With plenty to see and do, it’s a great way to impress your new class teacher or colleagues on Monday morning, this event will be perfect for all the family. Even better, the event is free to attend (although it does cost £3 to park all day) and will be running from 11am to 5pm. Photos by Mat Waldron & Roma Webb.